Thisstory was updated at 9:55 p.m. ET. CAPECANAVERAL, Fla. ? The space shuttle Discovery took its last journey to thelaunch pad Monday, six weeks before the spacecraft is due to lift off on itsfinal mission to space. Discoverywas expected to take six hours to travel atop a massive, Apollo-era crawlertransporter from its voluminous assembly building to the seaside Launch Pad 39Ahere at NASA's Kennedy Space Center. Hundreds of shuttle workers and theirfamilies turned out to cheer the shuttle on during its last launch pad trek. "Thisis most likely Discovery's last rollout to the launch pad, so a very momentousoccasion for us, but also a very emotional one for a lot of folks," theshuttle's vehicle flow manager Stephanie Stilson told SPACE.com. "There's a lotof excitement, but also a little bit of sadness over the fact that this willprobably be the last one." Theshuttle departed at 7:23 p.m. EDT (2323 GMT), traveling at the blazing speed of1 mph to traverse the 3.4 miles (5.5 km) between the VehicleAssembly Building and the launch complex. NASAsent out more than 700 invitations to shuttle workers so they could bring theirfamilies to watch Discovery's rollout from a viewing area located just near theriver rock-lined road that the treaded crawler transported followed to the pad. Discoveryis scheduled to lift off on NASA?s second-to-last flight of its nearly 30-year spaceshuttle program on Nov. 1. The mission will deliver a storage room to theInternational Space Station (ISS) and a humanoid robot assistant for theoutpost's astronaut crew. NASAis retiring Discovery and its two sister ships, Atlantis and Endeavour, as itshifts into a new space exploration plan aimed at sending astronauts to visitan asteroid and, ultimately, Mars. Onlytwo more shuttle flights are currently scheduled. Discovery will fly inNovember followed by Endeavour in February 2011. Theshuttle's first round trip to the launch pad came in July 1984, before it couldlaunch on its maiden mission. A launch abort required one of the orbiter?sthree main engines to be replaced before it could safely fly on the STS-41Dmission. Theorbiter, NASA?s oldest remaining in its fleet, returned to its assemblybuilding (and sometimes its processing hangar) for repairs before launchingfour more times in its 26-year history. In1991, Discovery rolled back for repairs to its cracked hinges before launchingon STS-39. Itreturned twice to the assembly building due to its external fuel tank beingdamaged -- once in 1995 as a result of a wayward woodpecker poking holes in thetank?s foam, and then again in 1999, after a hail storm riddled the tank withpockmarks. Discovery?smost recent repeated rollout was in May 2005 prior to the ?return to flight?STS-114 mission following the loss of space shuttle Columbia. Discovery, alsoknown by its orbiter designation ?OV-103,? was reinstalled on an external tankmodified with safety improvements. Stilsonhas watched over Discovery between flights for 11 missions, now, and said therewere tears in some members of her team when the shuttle left its maintenancehangar for the last time earlier this month. "Ithink I'll be a little more emotional for launch," Stilson said. Discovery'sfinal liftoff, she said, will be the surefire sign that Discovery's spaceflyingdays are ending, and a museum is ahead in the future, she added. Stilsonsaid Discovery's team of technicians and engineers have kept their focusdespite an uncertain future as NASA's space shuttle program winds down. NASAand its contractors have been laying off some workers as operations ramp down.The latestround of layoffs takes effect Oct. 1. Discovery?srollout to the launch pad follows its rollover from the orbiter processingfacility last week as yet another milestone along the path to its finalmission. Oncesecured on the pad, Discovery will continue to be readied for its Novemberlaunch, including being loaded with its primary payload, the PermanentLogistics Module "Leonardo." A modified moving van that previouslycarried supplies to and from the space station, the module will serve as astorage closet for the ISS. Theorbiter and its six-person STS-133 crew will undergo a dress rehearsal for thelaunch on Oct. 15. The Terminal Countdown Demonstration Test will proceedthrough a countdown as if it were launch day, but stop before the engines areignited. Discovery?sfinal flight will set the stage for the shuttle?sown finale. The STS-134 mission is slated to be flown by Endeavour in lateFebruary 2011 to deliver the Alpha Magnetic Spectrometer, a cosmic raydetector, to the space station. NASA is hoping for a third, extra shuttleflight on Atlantis, but it has not yet been approved by Congress. Barringanother mission being added ? a possibility currently under consideration byCongress ? 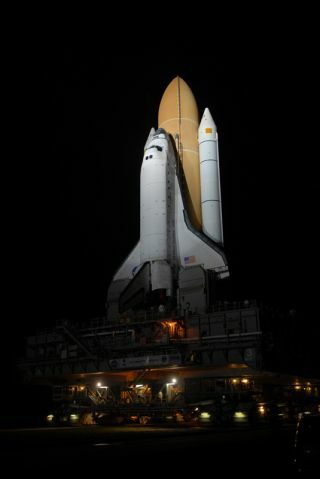 the space shuttle program will come to an end just a few monthsbefore its 30th anniversary on April 12, 2011. Click here to see photos of Discovery's launch pad rollout by Robert Pearlman. SPACE.com Managing Editor Tariq Malik contributed to this reportfrom New York City.